For the next two months, the Making Waves – Boat Making Workshop will move into the storefront of the Museum Lichtenberg. 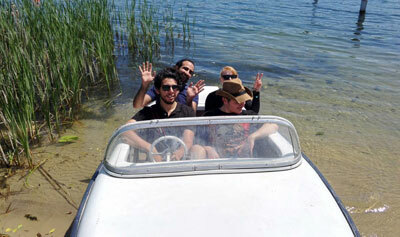 The project invites refugees to build a motorboat. Participants engage in all stages of the boat’s construction from design to completion. When the vessel is complete, the group will explore the region’s abundant waterways and converse about the divergent paths that led them here. Since January, the workshop has met weekly to construct models as a means to grow the team and learn about boat design. They’re now ready to start, but building a motorboat is not cheap! The group has launched an all-or-nothing crowd-funding campaign, which runs concurrently with their exhibition at the museum. The storefront space of the museum provides the group a campaign office, workshop space and direct access to the general public. Promotional videos, rewards, public feedback, social media initiatives and live online events materialize amidst a functioning and tangible model boat making workshop. The exhibition and mood of the team will change daily, with progress reports, donor correspondence, extracurricular activities, workshops and other events as they strive to achieve their funding goal. By designing a workshop in which refugees craft their own luxurious ride, Making Waves creates a more ambiguous cultural image than the ones presented by the media, politics or aid organizations. It is not an attempt to counter this image. Rather it purposely complicates the image, to create a new narrative, so that one might take notice, rather than passively dismissing it as known. Making Waves was initiated by artist Daniel Seiple. The team includes Hanna Jarada, Hassan Aji, Nawras Alwali, Emily Aruaz, Nafee Kurdi and Hiba Alyounes.